31st May at Mostyn Farm ride, starting at 11am. Nomination forms to Debbie Miller please (d.clwydfro@gmail.com). One senior team and two junior teams travelled to Shrewsbury to take part in United Pack’s 2-day competition on Bank Holiday weekend. There were 25 teams competing in the senior competition and 20 in the junior competition, with several teams having travelled over from Ireland. The Junior A team of Abbie Richardson, Cari Jones, Leia Lloyd-Williams and Isabella Stone competed well in the heats, finishing on 78 points after 3 sessions, in 10th place. They had a mixed time in the B final, winning some races and not doing so well in others – including one elimination for obstruction! But they all enjoyed themselves and finished in 6th place overall. The Junior B team of Ceri Lloyd-Williams, Daisy Stone, Elis Jones and Nansi Edwards finished on 32 points after the heats, and qualifying for the C final. One of the ponies was being a bit of a handful so they had assistance in the finals, which meant they couldn’t earn points. They did really well though, making very few mistakes, and even got a ‘wooden spoon’ trophy which they can share! The Senior team of Alex Owen, Ellie Richardson, Gwenan Roberts, Twm Cernyw and Will Stone had a very tough competition against some excellent senior teams. They finished on 54 points after the heats, scraping into the C final in 19th place, only 1 point ahead of 20th and the D final. So they had nothing to lose going into the final and rode fantastically. They went into the last race 5 points ahead of the team in 2nd place, and even though that race didn’t go according to plan, it didn’t make any difference to their lead. 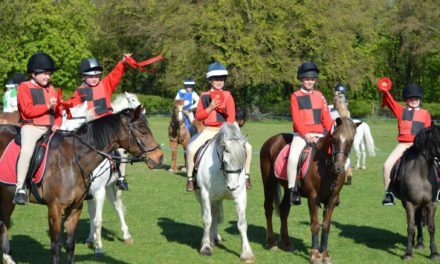 They came home with lovely blue rosettes, a shield, and big smiles on their faces; and they got to do the victory gallop down the middle of the arena! Forwarded on behalf of an East Cheshire member. 5* home with excellent facilities awaits a new friend for my daughter. Mare or gelding, no preference on colour or age (below 20), height 12.2-13.2hh. 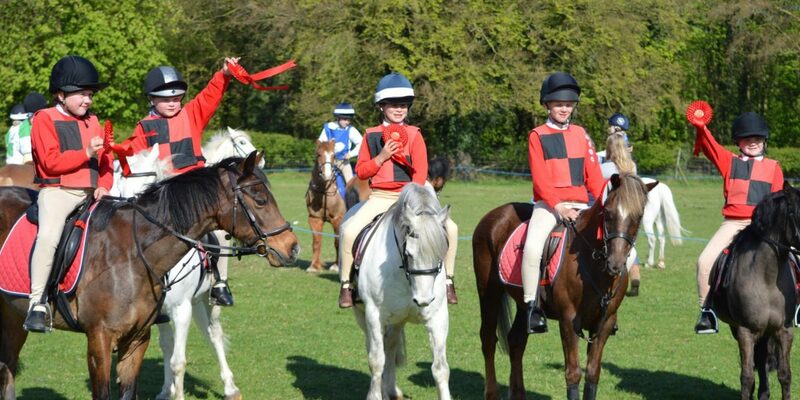 Pony for all pony club activities and showing and dressage. Must be good to load clip catch shoe etc. and trusty enough for my daughter to solely look after without having to worry about safety too much – must not be stressy. Kind and safe in all situations, e.g. traffic, trains (as main line runs through our yard! ), different environments, e.g. shows and rallies etc. References can be given and a loving home is without shadow of doubt. Looking to loan with view to buy or loan to move yards. Contact Melissa (07490 126734).